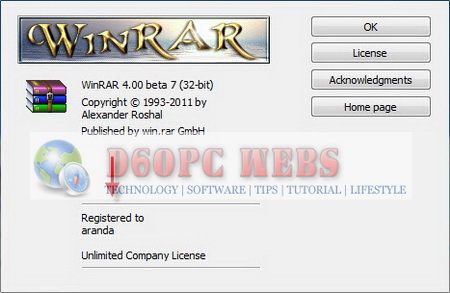 WinRAR has now been present with the version of Version 4.00 beta 7. There are several fixes and improvements compared with the previous version. As an application that has functionality in data compression of course required to be owned by each computer. With this program we can compress files anything and open it again anytime we want. WinRAR supports all popular compression formats (RAR, ZIP, CAB, ARJ, LZH, ACE, TAR, gzip, uue, ISO, BZIP2, Z and 7-Zip). You also can give a password on folders or files so that data can not be opened and viewed by others. And usually the compressed data will be secure and not damaged by virus. Very good file compressing software. plese send for me -winrar key- Tanks. Sounds very interesting, but i’d happy if dis works! !